Remember, Satan's plan is a counterfeit plan. It needs to look, feel and sound like the real deal. Wait a second. You don't think he would not have his own plan, do you? Come on. He is a liar and his craft is counterfeiting! Remember, God established the plan of salvation 2000 years ago and it has never changed. This is not what we see in our religious world today. We see all kinds of teachings from a variety of denominations and a pervasive attitude that everything is just fine. Here's how Satan's plan looks so far. Hear the word. Accept the Word. Sins are Forgiven, Repent, Confess Jesus as Lord, and finally, Obey anything you want... you can even pick and choose your favorite flavor of church with a complete smorgasbord of doctrines! Satan simply needs to convince us that salvation occurs before obedience to the Gospel. If he can do that, he might just have us for all eternity. Satan doesn't need to change the order of the plan. In fact, he will even let us repent, confess and obey any other Biblical command, after we accept his lie. Satan tells people they are saved as soon as they accept the message. Next, he's gotta do something which makes people believe, beyond a shadow of a doubt, that they have been saved... and this deception must be very, very convincing. People believe they have been saved when they confuse the feelings of surrendering to Christ, with a personal salvation experience. There is no argument that when many people accept Christ, they make real, sincere, serious and lasting commitments to Jesus. I did. This often occurs after rebelling against and resisting God's call for a long time. When someone ends the tug of war by surrendering, it feels awesome. When a sincere person makes a sincere decision to commit their life to Jesus, many quickly perceive that they can't continue living the life of sin they have been living. Their conscience condemns them. They know they have been living impure, immoral lives. So, to appease their conscience... now that they believe they have been saved; they quit drinking, smoking, doing drugs, they get married to the girlfriend they have been sleeping with. They stop lying they start tithing, studying their Bibles and attending church regularly. In short, once exposed to the truth of the scriptures and sincerely believing that they have been saved... many people repent. And guess what. Repentance feels amazing! For the first time in years, they have a clear conscience! It's wonderful! The problem is, they repented after what they believe was a salvation experience. You see, Satan hijacks this very real, very sincere commitment to Christ, and inserts a false plan, and does so quiet easily because the real plan is nowhere to be found. Next, he fills their hearts with warm fuzzies and surrounds them in a warm, welcoming, wonderfully deceived fellowship. Then, when someone approaches them with the Biblical Plan of salvation, they reject it because their experiences completely validate their very sincere commitment to a wrong plan. Satan has them exactly where he wants them... safe in church. People feel absolutely wonderful. For the first time in whenever, their lives are clean. They feel free, they are in a fellowship of acceptance. They have common goals and beliefs. They feel welcomed and included... in short, they feel loved! Now, remember, the benefits of following the Biblical plan mean your sins are forgiven but you also receive the Holy Spirit who comes to live in you and be a part of your fortification. If we have not yet obeyed the Biblical plan, the Holy Spirit has not yet moved in and taken up residence in our lives. It does not matter how we feel or what we experience which might serve to convince us to the contrary. God only gives His Holy Spirit to those who obey Him. Now, let me show you what happens when someone repents without following the Biblical plan. Anytime we clean up our lives by repenting and kicking out the evil, it feels absolutely wonderful. We get our houses cleaned out and we may even keep them clean for a very long time. But, if the Holy Spirit does not come and occupy the house as a result of our correct obedience to the truth, all sorts of other lying spirits are free to move in, carrying with them a wide range of false teachings. It's impossible to tell if we are deceived because we simply don't have the tools to spot a counterfeit and without the Holy Spirit indwelling us, we do not have a certain spiritual sensitivity He provides. Repentance at any stage of spiritual life always feels great. In fact, many people who sincerely believe they were saved by simply accepting Christ may be tempted to point to their squeaky clean life or all the great things they have done for Jesus, as proof of salvation. That would be a great example of putting experiences over the word of God. We must never allow emotions, feelings or even some really righteous experiences to become our spiritual authority. Emotions are utterly unreliable! I have a hunch... even evil spirits who's job it is to deceive us probably appreciate a clean house. If Satan can't make us bad he will make us blind. Remember, with humility comes wisdom. We must always be open to having our beliefs challenged in a loving respectful way. Having this attitude of humility, as we've already seen, is a matter of salvation too. In the denominational world's plan of salvation, it is not uncommon for people who attend religious services and make a commitment to Jesus by a show of hands or coming forward for an alter call. The preacher may claim that several people "got saved" at the service. Now when you hear this claim, this is a solid confirmation that they believe salvation occurs sometime before true biblical obedience. Once again, since "accepting Christ for salvation" is such a pervasive teaching, let's look at couple more of the common scriptures used to support it. These two passages are often used as additional proof texts for the "Sinner's Prayer" or simply accepting Christ for salvation and to illustrate that "ALL" we need to do is believe in Jesus to be saved. The first one comes from a passage in Acts 16 after Paul and Silas have been thrown in jail. An earthquake frees all the prisoners, and a prison guard decides to respond to Paul's lyrical preaching. Acts 16:30-31 He then brought them out and asked, Sirs, what must I do to be saved? They replied, Believe in the Lord Jesus, and you will be saved you and your household. When we look at these two passages, we see Paul and the author of Hebrews telling folks to believe in order to be saved. If we had no other scriptures, it might be easy to conclude that this was all we needed to do in order for God to remove our sins. My religious friends have told me with gusto, "Look, it says nothing about repentance, confession or obedience! All we need to do is believe." Let's be honest here. First of all, these scriptures do not say "ALL" we need to do is believe. If we used that same logic, we could just as easily say, "Look at Romans 10:9. ALL you need to do is confess Jesus as Lord. It says nothing about hearing or accepting the message or repentance." Would the Bible tell us to only believe in one place, and associate belief with the forgiveness of sins, and then tell us to repent or confess in another place so that our sins would be wiped out? Wouldn't that be a contradiction? Sure it would. The only way we can harmonize this is to accept the fact that the plan of salvation includes all of those things. The Bible will not contradict itself. True saving faith in Jesus Christ includes all the things we have studied so far. In many places, the Bible simply refers to this as believing in Jesus and assumes that we should know that saving faith includes obeying the will of God, as is so clearly stated in Matthew 7:21 and following. Matthew 7:21 Not everyone who says to me, Lord, Lord, will enter the kingdom of heaven, but only he who does the will of my Father who is in heaven. Intellectual belief or assent alone is simply not the appropriate response to the Gospel. Therefore, when we see a phrase like "believe and be saved," we automatically know that true Biblical belief includes doing the will of God and we have already seen that this includes confession, repentance and obedience. We simply can not pick and choose which ones we think are worthy of merit and none of the things we have studied so far can stand alone by themselves. They're all related to the forgiveness of sins. 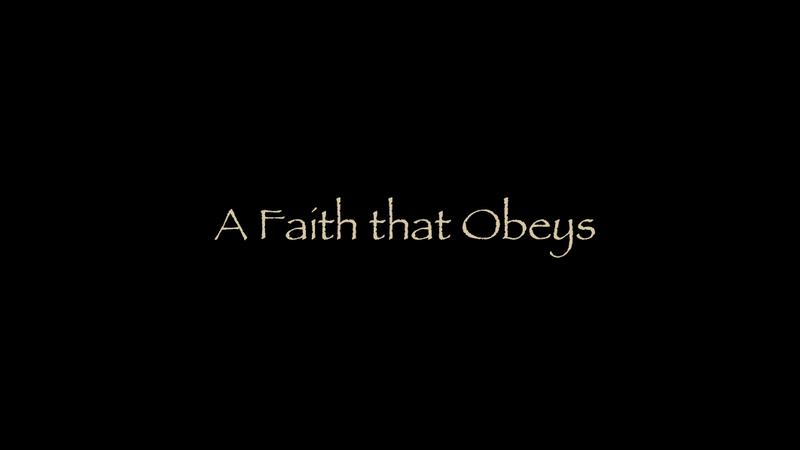 Just because Paul or Peter say a phrase like "believe and you will be saved," we know the kind of belief they are talking about must include obedience to God's will. Here's a little illustration. This morning, I brushed my teeth. My wife is very happy. Did I use a toothbrush? Did I use a little water? Did I use a bit of toothpaste? You see, I did not need to tell you everything which was included in brushing my teeth, it is assumed. True biblical belief assumes more than simple intellectual agreement. Remember our wall of sin? We're still looking for the exact point in time God removes that barrier. We now know it is not when we simply hear the word, believe it and repent. Biblical belief includes Biblical obedience. So, what is that? Let's talk about that next.